Steve Mason chats with Culligan dealers at the Mickey booth. 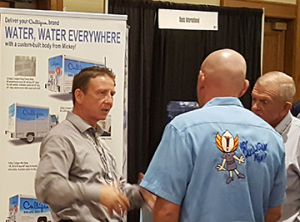 Hundreds of Culligan dealers from the U.S. and Canada attended their recent 2017 Convention & Product Fair in St. Louis looking for innovative new ideas in bottled water delivery, and as usual, Mickey Truck Bodies did not disappoint them. “Mickey has been a supporter and strategic partner of Culligan for many years,” says Steve Mason, Mickey’s Midwest Regional Manager. “Dealers made it a point to express their appreciation for our long-time service and support.” From mini bodies with Mickey-designed “flip-out steps” to reinforced floors, door panels, lift gates and custom bay depths to accommodate salt and bottled water racks, Culligan dealers “really understand and value the thought and expertise that we put into designing bodies that make their jobs easier and safer,” Steve points out. Joe Rudolph, Director of Business Development for Roush CleanTech, a division of Roush Enterprises, joined the Mickey team at the Culligan gathering to discuss how alternative fuels technologies, such as propane, can significantly reduce the total cost of vehicle ownership while also lowering emissions and enhancing market value and recognition.